This solution is based on MIS771 descriptive analysis and visualization assignment in which we discuss about exploratory, descriptive and regression analysis to gain a comprehensive understanding of house prices in a city. This is an individual assignment, which requires you to analyse a given data set, interpret, draw conclusions from your analysis, and then convey your conclusions in a written report to a person with little or no knowledge of Business Analytics. 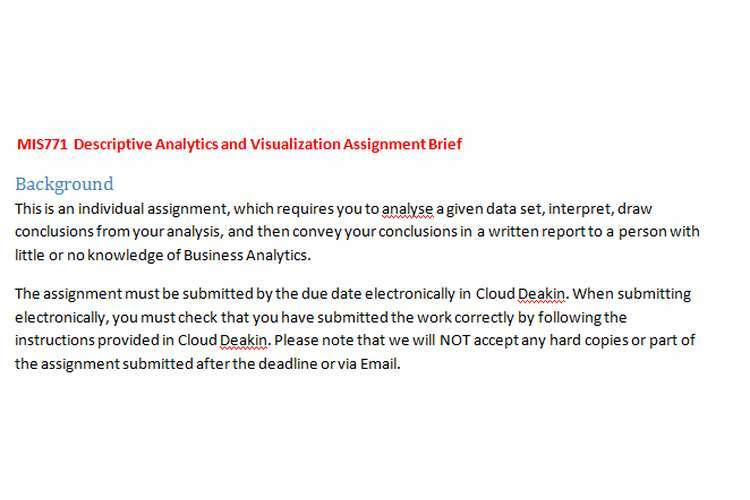 The assignment must be submitted by the due date electronically in Cloud Deakin. When submitting electronically, you must check that you have submitted the work correctly by following the instructions provided in Cloud Deakin. Please note that we will not accept any hard copies or part of the assignment submitted after the deadline or via Email. Extensions of time are not permitted. A penalty of 10% of the 40 marks allocated to this assessment task will be deducted for each day or part day that the assessment is late. Penalties include weekend days. The assignment uses the file Shirazt.xlsx which can be downloaded from Cloud Deakin. Analysis of the data requires the use of techniques predominately studied in Module 2 (but will also require a degree of knowledge from Module 1). Shiraz is a (fictitious) local government area (called a 'city') within greater Melbourne, Australia. It consists of some different suburbs, all with their history of development. The city grew in different stages, with new suburbs gradually emerging. It covers some wealthy suburbs and some not so wealthy. The city is located on the Bay and about 60,000 people live in the suburbs of Shiraz. The main objective is to conduct exploratory, descriptive and regression analysis to gain a comprehensive understanding of house prices in the Shiraz region and an understanding of the most important factors that impact prices. Your analysis will be based on a random sample of 120 houses from the city. Note that for the purpose of the assignment the unit of analysis is a ‘House’. It is defined as a stand-alone dwelling. That is, flats, apartments, etc. are not included in the database. Actual or estimated weekly rent in $. Only analyse Price by itself. The importance of other variables is considered in other tasks. You should, at the very least, thoroughly investigate relevant summary measures (and their reliability) for this variable. Also, there may well be suitable tables and graphs that will illustrate, further and more clearly, other important features of house prices. In your report you should comment, where relevant, on data location, central tendency, variability, shape and outliers for this variable. Analyse house prices against all other variables included in the dataset. Use appropriate descriptive techniques such as cross-tabulations, comparative summary measures, scatter diagrams to identify key relationships. In your report you should only include the most important factors that impact house prices (approximately between 3 – 5 factors). You should follow the model building process outlined in topic 5. You are only required to consider linear relationships in the model. Each stage of developing your model should be included in your analysis. You will notice in the Shiraz spreadsheet that there are tabs called Q3.1, Q3.2, etc. These are where you place each version of your model. Note that if you have undertaken more iterations of the model then add more worksheets. The report should only include your final model and a description of its overall strength as well as the influence of each variable. Quarterly median house prices in Shiraz from Q1, 2012 to Q4, 2015 are given in QtrPriceData worksheet. Develop a multiplicative time series model to forecast median house prices for the next 4 quarters (Q1, 2016 to Q4, 2016). If the observed values for those 4 quarters are as below, calculate the MAPE of the forecast.